Hello everyone! Pardon my delay in getting up any recent posts as I have been well immersed into a summer session graduate class at the Rochester Institute of Technology. I am excited to continue to study the relationship of our farmers’ markets and community and will begin filming and documenting interviews with our local market vendors and attendees. Stay updated by subscribing to my blog and as always your feedback is extremely welcome and appreciated! 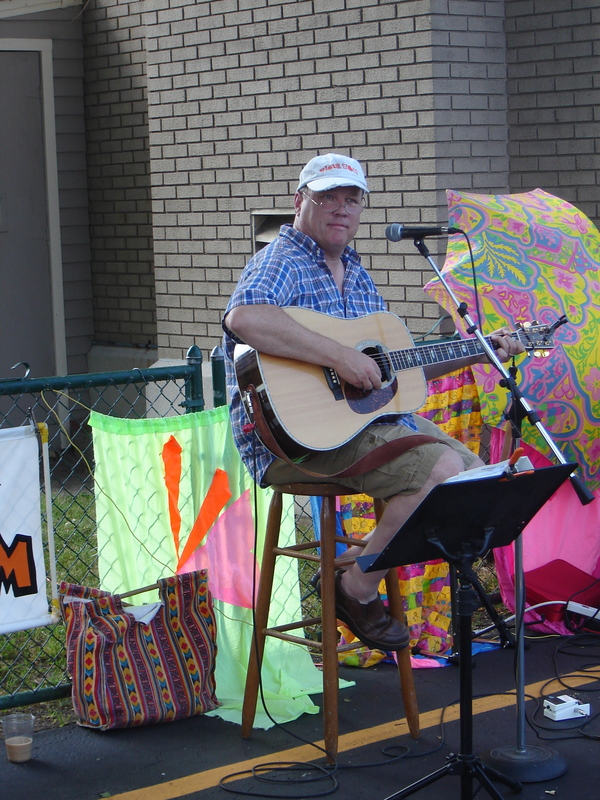 I have decided to focus this blog entry on the relationship of the Arts and our local Farmers’ Markets. I am a tremendous believer in the power of artistic expression and its ability to foster and grow community and I have pursued electives in the Arts including an Art Gallery Managment class here at RIT in an effort to understand the role that Art can play in community. My undergraduate degree is in Music Industry from SUNY College at Oneonta in Oneonta, NY and my desire is to continue to create places of community and vibrancy around the Arts and music. 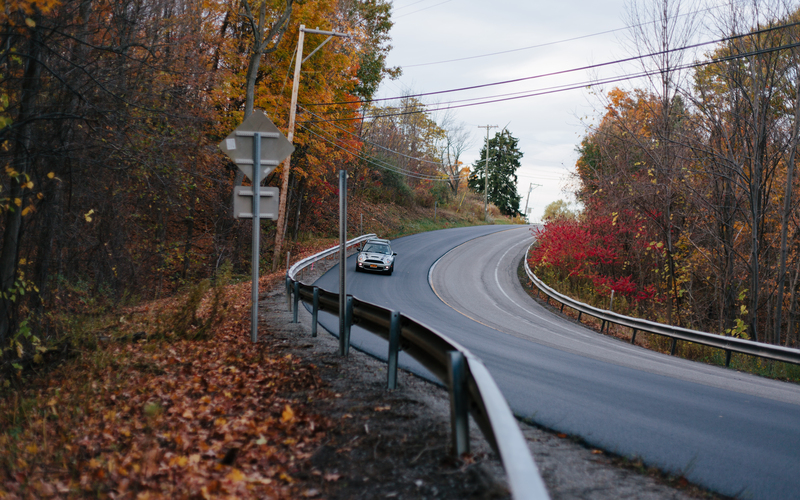 On a recent trip to across New England, I happened to visit in Burlington, Vermont on the way back to New York. To my surprise and delight it turned out that the Burlington Farmers’ Market happened to be in full swing the morning of my arrival. The market was a tremendous explosion of people, fresh produce, beautiful fresh cut flowers, music, maple syrup (of course!) and prepared foods and most surprisingly, the Arts! 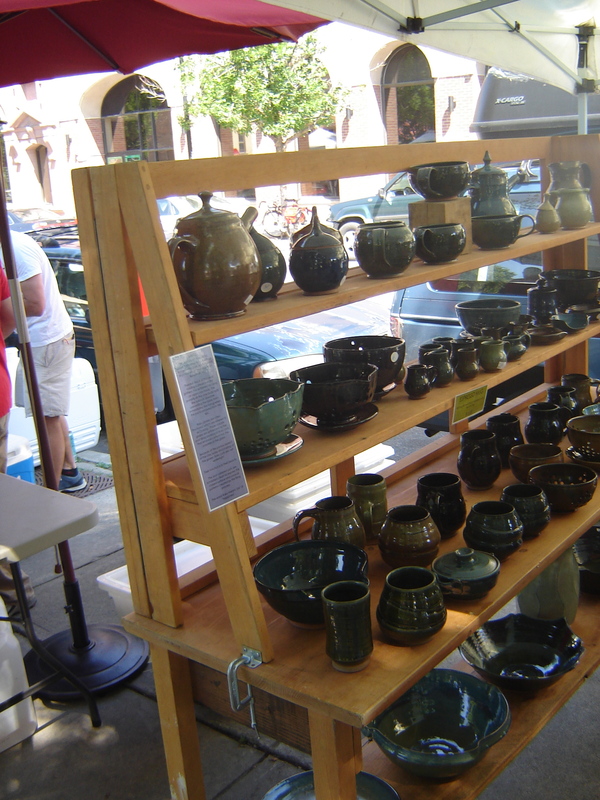 The market featured a beautiful selection of artistic goods including pottery, blown glass, wood and ironwork, hand-spun clothing, jewelry, framed prints and even natural soaps. The market tremendously highlighted the local craftsmen and woman from the area and brought an incredible dynamic to an already fresh and vibrant market. 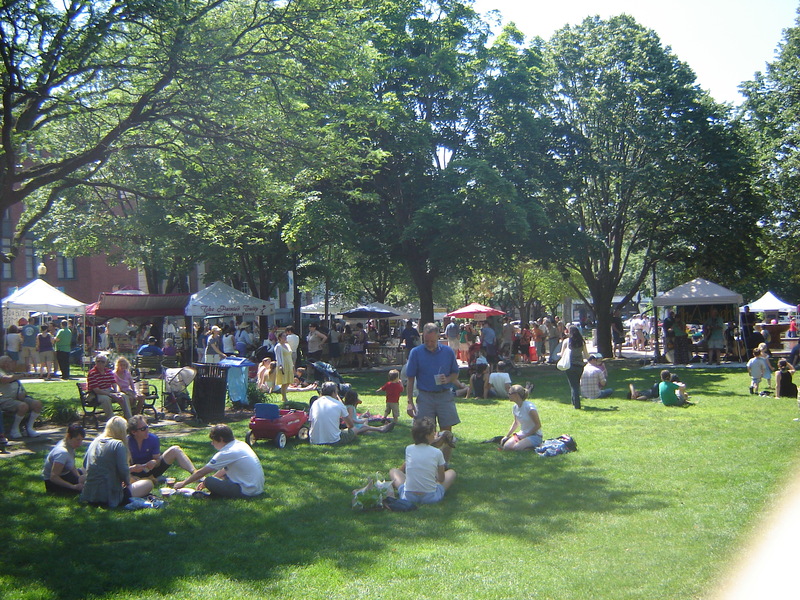 This Burlington Farmers’ Market held in the City Hall Park brought a new focus to the Arts that I have not seen with any other market I have experienced since Pike’s Place Market in Seattle, WA. The fact that this was a purely outdoor market (versus Pike’s Place) made this even more impressive. It honestly dawned on me for the first time that the Arts ability to create community, and my belief in our farmers markets to become centers of community and “third places” could be paired together in the same vision! 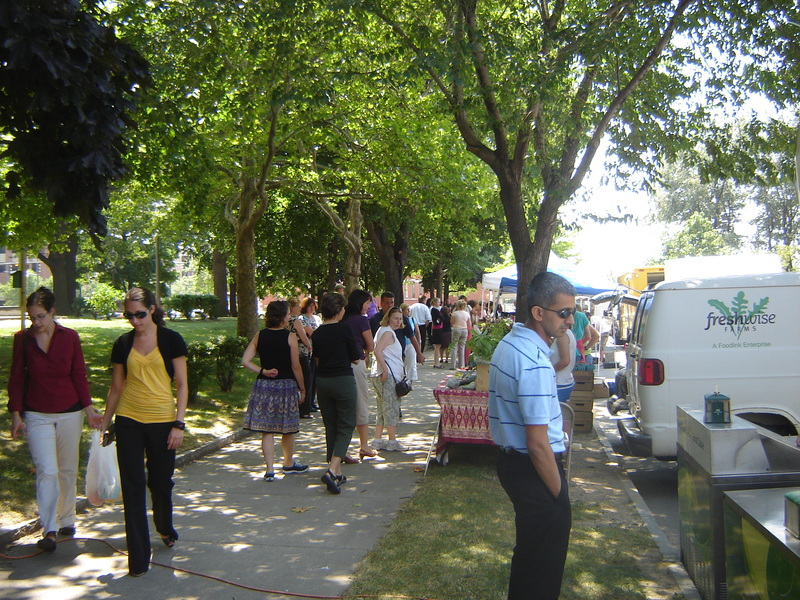 The Vermont farmers market has been running for over 30 Years since its inception in 1980 and by all appearnces this market was every bit of the expression of Burlington that I could experience. There is something purely human about expresses oneself in your dedicated craft or trade and I genuinely felt that both the farmers’ and the artists represented this with passion and a commitment to excellence. How do you feel about the the Arts and music in our markets? Do you agree that the expression of these adds to the value and community that is being cultivated? Have you experienced a market where the Arts or Music are highlighted? Your feedback is welcome! Thank You! As stated in my previous post, I wanted to devote my next entry to the conversation I had with Chris Hartman about the Good Food Collective and the idea of our region’s local rural farms looking for ways to get food into urban communities. Chris was generous enough to take the time to talk with me in detail about the South Wedge Farmers’ Market and his desire to build off of the Farmers’ Markets to continue to find ways to bring healthy food into the communities of Rochester. He was the founder or the South Wedge Farmers Market back in 2007. The market was started with a desire to infuse an urban neighborhood with producer-only vendors from farms across central New York State. The Good Food Collective is a gathering of local farms and is demonstrating a new model to bring local food into Rochester. In my conversation with Chris, he highlighted the wonderful benefits of what something like a local farmers’ market means, and spoke of the same ideas of “place-making” and the idea that farmers’ markets are rich in social capital…the wealth and value that each person brings who attends that market (the Regulars per “Farmers Markets as Place-making”). There are great positives to having farmers’ markets, but Chris also pointed out the issue with farmers’ markets being inefficient. Why is this the case? The access to fresh food is limited. Traditionally local markets only run once a week and for a few hours. They are seasonal and weather dependent, and farmers travel great distances (in this case up to 100 miles) to bring fresh food to market. Even the hours they spend at market may take away from other farming duties. With the belief that farmers markets should continue to exist, Chris also stated the need to create localized food systems that would benefit the community as a whole over the long-term. 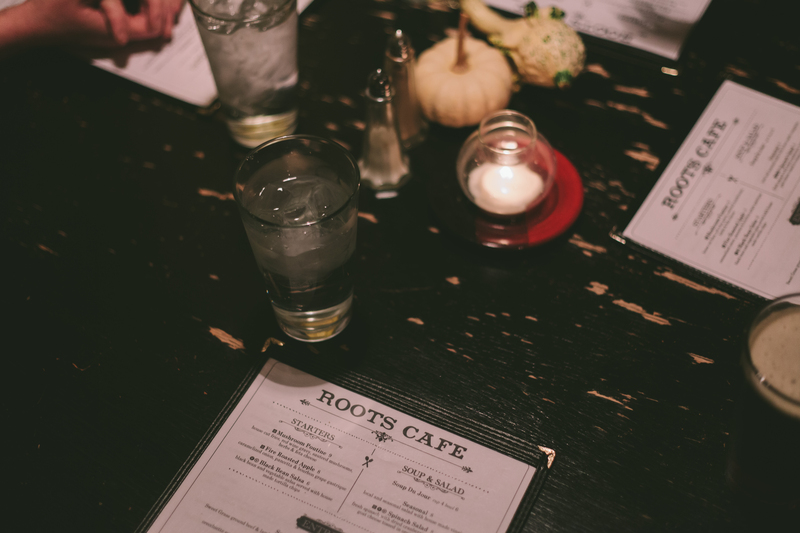 This is where the Good Food Collective excels. The Good Food Collective is a collaboration of Chris’ company, Head Water Foods Inc., and the partnership of nine other local farms. Those farms differ in their offerings but I have listed them below with a brief description and links so you may learn more about each of them. Fraser’s Garlic Farm– organic garlic, potatoes, leafy vegetables, root crops, edible pumpkins and certified organic eggs from free-range chickens. Honeyhill Farm-certified organic, pasture-raised chickens & beef, vegetables and 20 tomato varieties. Lighthouse Gardens-greenhouse grown annuals and perennials including herb and vegetable starts. Raindance Harvest-Sustainably grown transplants, mixed greens, and assorted vegetables. Together these farms are assisting in the vision of a multi-farm CSA or Community Supported Agriculture model for the Good Food Collective. 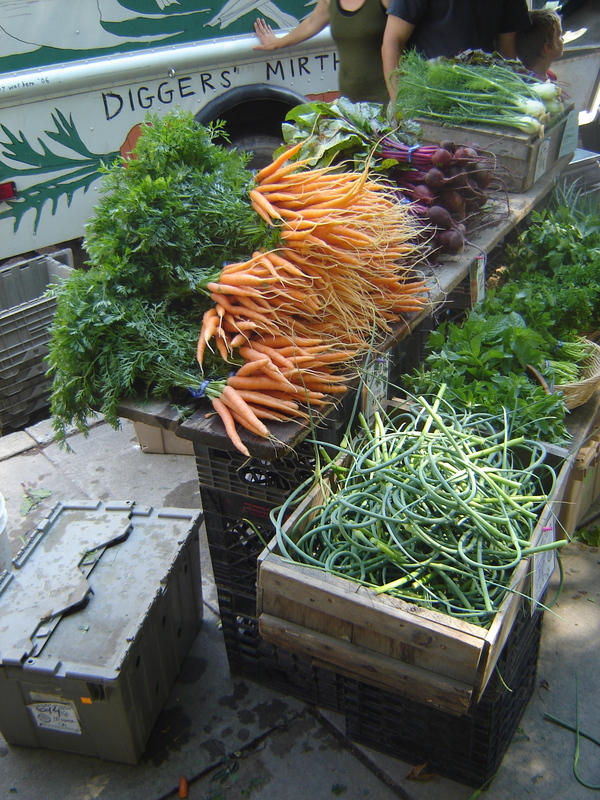 In a CSA, people buy into farms as shareholders an in return receive a share of the farms weekly harvest. This model enables the farms to receive support and money up fron,t and to benefit people with local and fresh produce (see the offerings of each farm above). I want to thank Chris for his commitment to bringing Rochester’s agricultural offerings to the surface, and to bringing attention to the incredible wealth that our local farms are injecting into our city. I ultimately believe that if we can continue to highlight the profound local and regional agriculture that exists around Rochester, we can become known as a world class agricultural destination. The impact on our neighborhoods, our city, and our communities could be tremendous! Support our local farmers and support our city in becoming known for our agritourism. 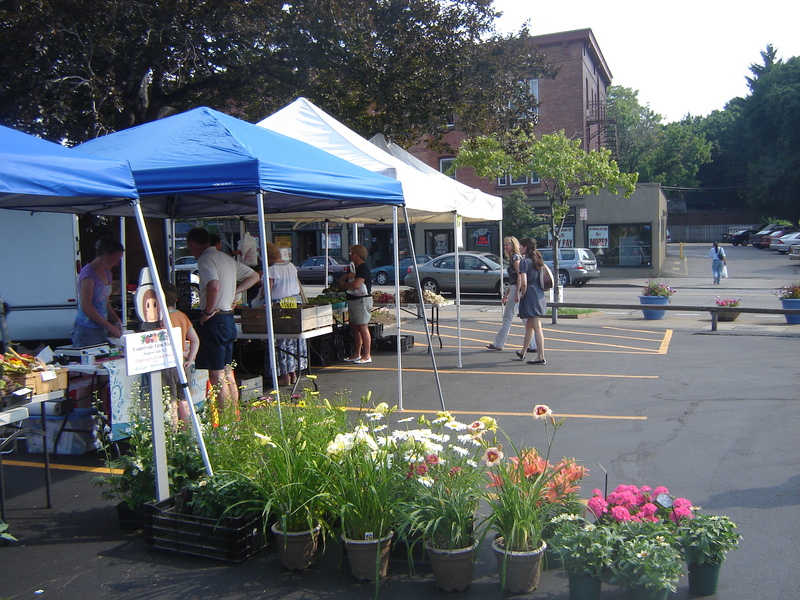 The market is officially run by the SWPC which serves one of the oldest neighborhoods in the city of Rochester. I am proud to call this my new neighborhood and just moved here this past May (more on that in another post perhaps). The South Wedge Farmers’ Market has been an inspiration to many other markets in the area because of its strong focus on community, commitment to local produce, and neighborhood identity. The market is now entering it’s 4th year anniversary. My attraction to this market comes in the utilization of the market as a “third place” as stated in my previous blog post “Farmers Markets as Place-making.” The greatest attribute of this market is that conversation is the main activity. This is stated in no way to undermine the fact that the produce and goods are as fresh and local as you can imagine, but instead speaks to the ability the market has to educate and create dialougue around healthy food, healthy people and community well-being. "Conversation is the Main Activity"
As stated on the SWPC website, the South Wedge Farmers’ Market “educates and encourages healthy eating for long term health.” The educational experience with this market is like nothing else I have experienced in the area up to this point. 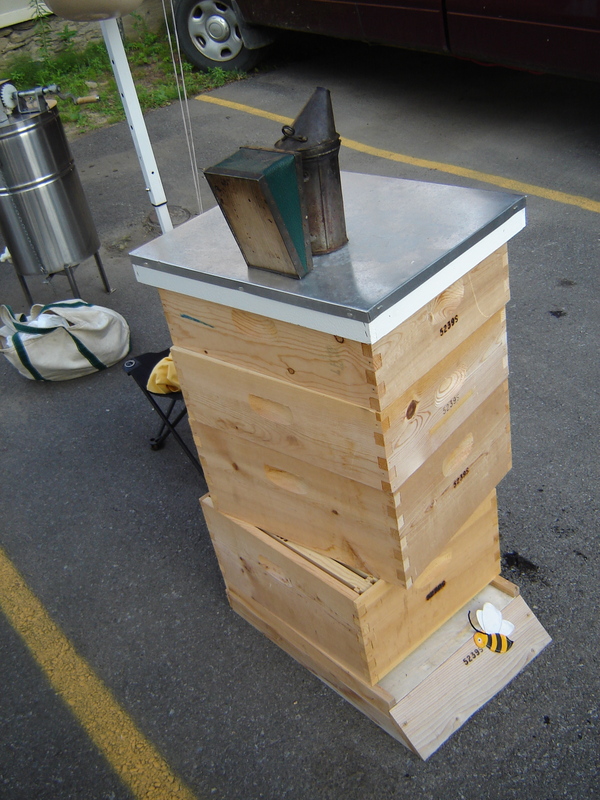 The day I attended the market, Jill Stackpole of Bloomfield Honey was speaking on how to be a beekeeper and demonstrating how we get our honey. 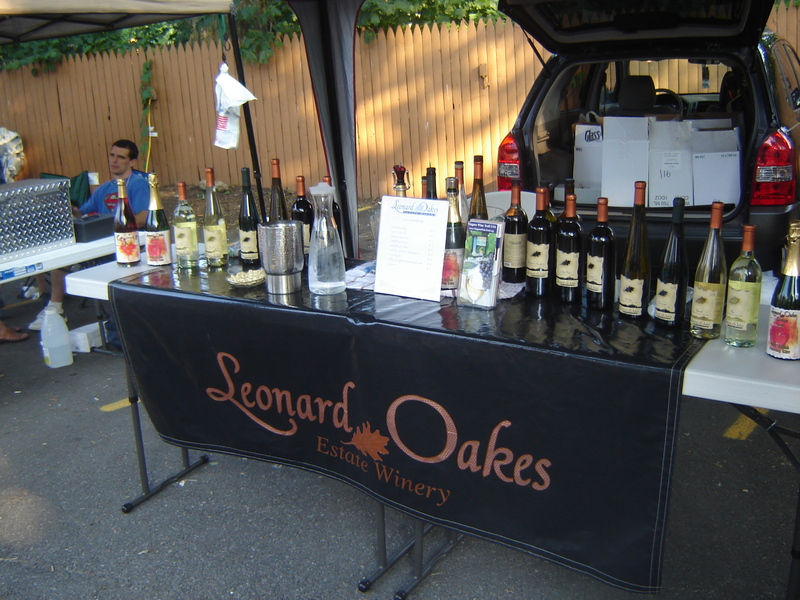 Everything about this market was engaging, whether I was learning about organic baking methods from Small World Bakery, learning about Bloomfield honey and beekeeping, or learning about incredible wine varietals from Jerod and his family-run Leonard Oaks Estate Winery. 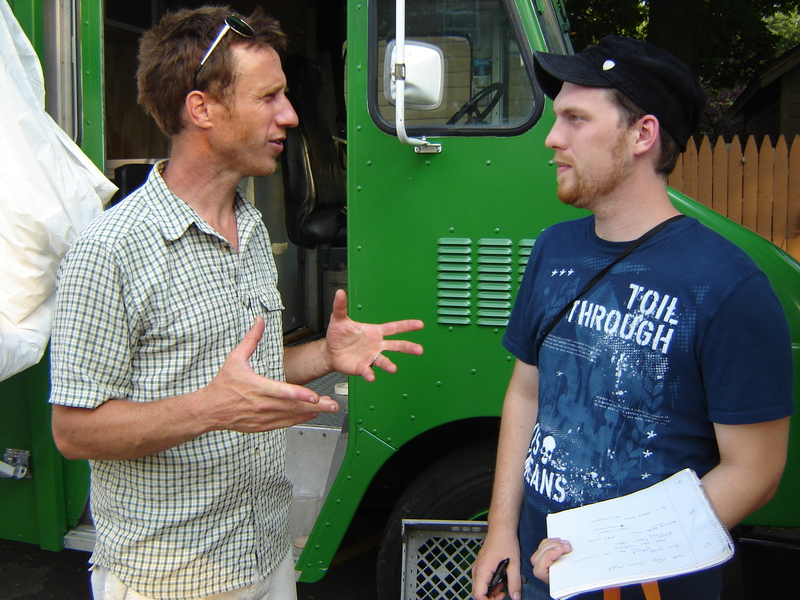 I had an incredible conversation with Chris Hartman from the Good Food Collective, who is also the founder and manager of the South Wedge Farmers’ Market, about the desire to move “good food” into the communities of Rochester. I will devote my next article to discussing this topic and his efforts. This market had the ability to engage and educate, and as I looked around I genuinely felt that people were not only getting to experience this market as a “third place” and a place of community, but also getting to learn about the food and the incredible people and processes that had brought healthy and local food to them. As this market continues to flourish, my hope is that the model demonstrated through SWPC will continue to spread into neighborhoods associations and planning committees across Rochester area neighborhoods. These markets need to be seen as a way to bring cultural vibrancy and community well-being to the people of our city. In my continued engagement of our local farmers’ markets, I have began to realize just how much life these markets have the ability to bring to our different urban neighborhoods across the city of Rochester. One such market has given me a very real picture of how much transformation these markets are capable of creating. 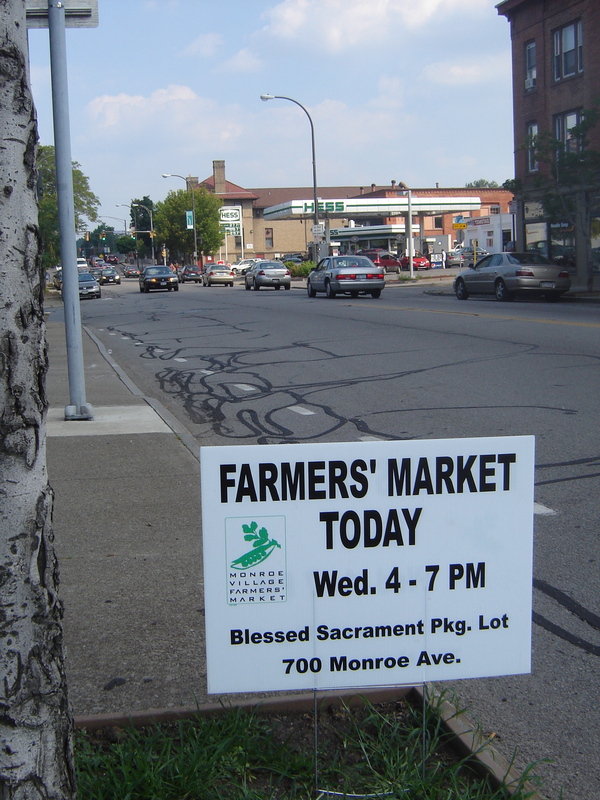 The Monroe Avenue Farmers’ Market is set in one of the busiest sections of downtown Rochester with very high traffic flow and an abundance of asphalt in the region. Here, at the Blessed Sacrament Church, new life is being fed into this community by transforming a parking lot into a public space. This parking lot assumes new character and new life during the hours of 4-7 pm every Wednesday, throughout the summer. As the first vendors began setting up on this past Wednesday, I was struck with the idea that these markets really do, “make the asphalt come alive.” It’s not often that we can take something as utilitarian as a parking lot and add vibrancy, beauty, and community to it, but that’s exactly what has been occurring every week at this market. Making the asphalt come "alive"
On this particular day, a variety of vendors fills the parking lot with sights, smells, and sounds and it appears to me that the market itself redefines where the center of Monroe Avenue is. Pedestrians, dog-walkers, and passerby’s all take notice of the market and many begin to wander into the market to see what it has to offer. There is a acoustic folk musician playing while the smells of fresh local flowers, brewed coffee, and grilled hot dogs and “carrot hots” waft across the market. The beautiful displays of produce and plants adds green and an assortment of fresh color to the black asphalt floor of the marketplace. 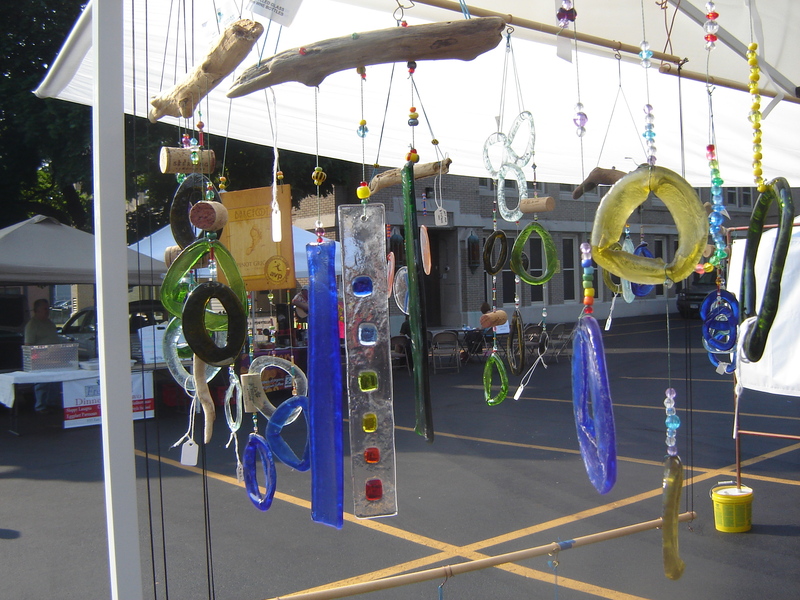 Today the market is featuring a local artist who has designed hanging chimes and jewelery made out of driftwood and recycled wine bottles and other glass. The sunlight beautifully reflects in the color of the artists work and brings yet another level to the experience and beauty of the marketplace. It is the fact that this place becomes such an attraction to those in the area that intrigues me. This place becomes a new center of attraction for both the residents and passerbys on Monroe Ave on this hot summer day. What was simply a neglected parking lot just a few hours ago is now a source of experience and attention. I can’t help but wonder how many places exist so similar to this place. How many parking lots do we have that sit unused that may have the ability to actually serve a purpose such as this one? We need to bring life to these places. Can you think of local areas that could be transformed in a similar manner in your own neighborhood or urban area? How much asphalt could we animate and create life around? These are some areas I will contemplate as I continue my studies in how our farmers’ markets are creating places of life and community. Many of you are probably familiar with the book “The Great Good Place” by Ray Oldenburg, but for those of you that are not familiar, a brief summary is in order. Ray Oldenburg discusses challenges in the lack of community we experience here in the United States, and describes how many of us are searching for “third places,” …communities where we can gather outside of our first place (home) and second place (work). Do our local farmers’ markets meet Ray Oldenburg’s qualifications for a third place? On Neutral Ground – Can all feel welcome and comfortable? The Third Place Is a Leveler – Are differences between people eliminated and are all made equal? Conversation Is the Main Activity – Is there engaging dialogue that is sustaining the third place? Is there dynamic association with one another? Accessibility and Accommodation – Can one frequent the third place anytime and find assurance in acquaintance? Does a community life exist there? The Regulars – Are the right people there to make the place feel alive? Do the regulars give the third place its character? A Low Profile – Is the third place typically plain or unimposing? Is it an expected part of life that can be perceived as ordinary or routine? The Mood is Playful – Do joy and acceptance reign over anxiety and alienation? Does the third place engagement and entertainment form association? It is my belief that these attributes strongly relate to the local markets that I have participated in as a vendor or as a customer. As we look at the various markets across the city of Rochester, I believe these attributes will become clear as these markets maintain similarity as “third places,” and yet the relationships within each of these markets remain dynamically different from one another. I look forward to introducing you to these markets through both the lens of being a vendor with Joe Bean Coffee Roasters and understanding the viewpoint from the agricultural community, and being a market participant who shops for my food and goods, and meets the providers and farmers who enable these markets to exist. If you are interested in purchasing The Great Good Place it is available for purchase by clicking below. …and so begins my first blog entry, with many more to come. I am embarking on a mission to understand and learn what the agricultural presence in our region means to the city of Rochester, NY and beyond. I am a Graduate student at the Rochester Institute of Technology who is initiating an independent study with Dr. James Myers to learn about the dynamic impact our local farmers markets create, and how they “plant,” sustain (water), and “grow” into places of community that inspire new culture. My belief is that our markets are becoming a new type of public square, where the benefits far exceed the amazing produce and locally-made artisan products, and extend to enriching culture, creating community, and encouraging dialogue. 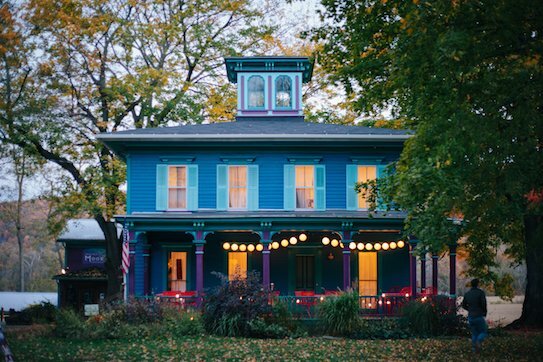 These markets are creating “place,” and theses places are bringing vibrancy to our barren city landscapes. 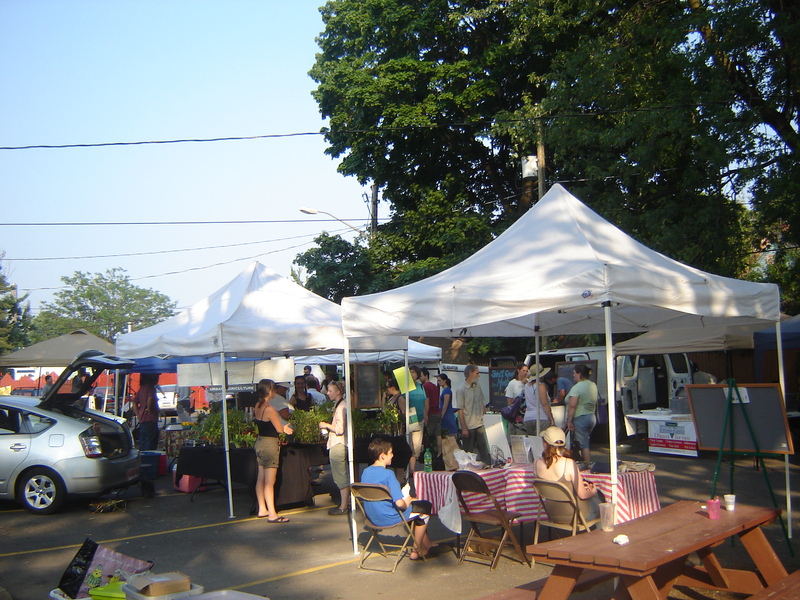 I have a deep desire to learn how these farmers markets are adding value to the lives of those here in Upstate New York, and my hope is to highlight the agricultural assets we have in this city in an effort to better inform the public of these places of food, life, the arts, and culture. Follow me as I commit to study our exceptional farmers markets and the agricultural community this summer. I hope you will find this blog both exciting and enlightening. I know that I am genuinely excited to bring all that I learn to you.